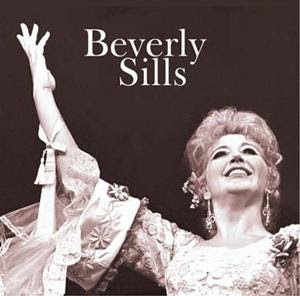 On October 7th, the Estate of Beverly Sills (1929-2007) is being auctioned by Doyle New York. The auction description reads, "Beverly Sills’ remarkably diverse collection comprises over 460 lots of fine art, furniture, decorations, jewelry, handbags, photographs, costume designs and opera memorabilia from her home overlooking New York’s Central Park." The catalogue is searchable. Type in the key words "opera" and "costume" to see original sketches of costumes she wore in many of her opera performances, as well as production posters, playbills and costume items. Search "photograph" to see a number of production photos. The estate items will on public exhibition from October 2nd through 6th at Doyle New York, on 87th between Lexington and Third Avenue. 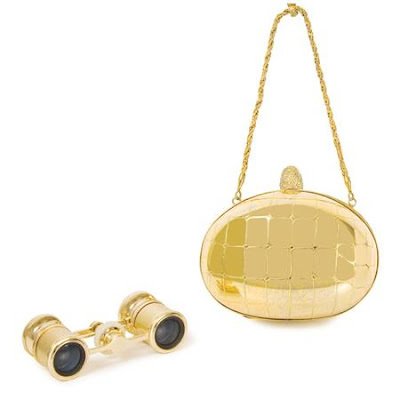 Feel free to bid on these opera glasses for me: Sale 09BS01 Lot 449, Koret Minaudiere and Pair of Opera Glasses, The minaudiere of gold metal molded with alligator scales, the conical catch studded with small rhinestones, twisted chain wrist strap, stamped in silver: Koret with leaping gazelle logo, the opera glasses in gold-tone metal and leather, stamped: Mignon Japan. 5 x 4 inches, wrist strap 12 inches. Ummmm. And I would like the black ball gown designed for Violetta to wear to the Chicago Symphony Gala next month.